Rocks! When my students enter my Geology class I ask them “What do you think we will study this year?” They always answer “Rocks!” Now, some of these responses are from eager-eyed students 😄 who are just as goofy and excited as me about this field. But let’s face it, most say “Rocks!” with an eye roll and a slouch in the chair 😾! They are thinking to themselves “Why do I have to take this class?” and “This is going to be so stupid”. Many have been taught to believe that rocks are for little kids or that there is nothing worth learning about them. I view it as my job to show students how awesome rocks are and that there is a difference between rocks and minerals. September brings the month that I introduce minerals. 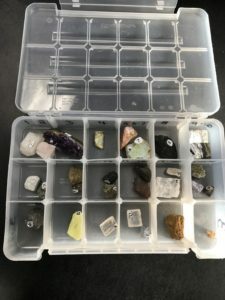 It is not a long unit for me, but it is challenging for many students and also eye opening for many because there are so many more minerals than they ever thought possible. Not to mention that they are much more interesting than what they could have imagined. I find it interesting that the word “identification” is level 1 on Bloom’s taxonomy. In most cases identifying something is quite straight forward and I agree with its placement at this most basic level of thought. However, when it comes to “identifying minerals”, the word takes on a much more comprehensive and complex meaning. In order to identify a mineral accurately, many physical properties of minerals must be fully understood. Some of these physical properties are simple such as describing the color or streak of a mineral. But identifying luster is much more difficult for students. It took me years to realize that students struggled with truly understanding this word. 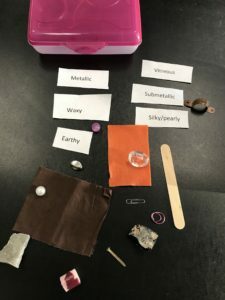 If students cannot accurately identify the luster of a mineral, they will not be able to accurately follow a dichotomous key to correctly “identify” the name of the mineral. In an effort to help students comprehend this concept better, I compiled luster boxes filled with numerous items with various lusters. Some of these objects are in fact rocks or minerals, but the majority of them are something else. The most common issue students have is in identifying a metallic luster. Although it seems straight forward to me, it is not to students. Therefore, I have included several metallic and submetallic objects in the box to help students understand the term luster. Spending 15 to 20 minutes with these boxes has been extraordinarily helpful in identifying the specific types of luster. This is most important if you are having students identify 20 or more minerals. Minerals have the added “hook” of spending time talking about gems. All gems are minerals, but not all minerals are gems. Creating a PowerPoint with a variety of famous gemstones is a great way to grab the attention of students. It is also useful if you are teaching high school students who might be considering purchasing a class ring. What are the birthstones? Do you like your birth stone? (Midnight Star does not!) Are you required to purchase a ring with your birthstone? Did you know there are multiple birthstones for every month? What does it mean to purchase a 1-carat stone? Spending time Googling pictures of specific gems is a sure hit. In addition, I spend time talking about alloys. There are several short videos on line that talk about 10K vs. 18K gold. Printing articles about the process of making alloys makes for good reading that crosses into the field of chemistry. There are many such places where different science field cross the path of geology and I make a point of discussing them every chance I get.